Egg salad can be a hit or miss! It can end up being loaded with way too much mayo or has way too many eggs. This egg salad is the perfect combination of both and it’s gluten-free and paleo! I always thought egg salad was somewhat complicated to make. I was wrong! The hardest part is boiling all the eggs because the next step after that is just chopping them up, adding the rest of the ingredients, and letting it chill. 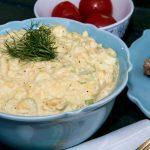 Try this lightened up egg salad out! It might become your next go-to recipe. A yummy egg salad recipe that goes with anything! Serve it as a side to your BBQ or as a yummy sandwich for lunch. Hard boil 6 to 9 eggs, per your favorite method. I put the eggs in the oven at 350 degrees for 30 minutes then immediately transfer to cold ice water. Let eggs cool. While the eggs cool, finely dice the onion and celery. Set aside. Peel eggs and dice into small bite-sized pieces. Add mayonnaise and mustard. Mix thoroughly. Last, add the salt and pepper. Give it one good mix through so everything is combined. Enjoy! Next articlePan-Seared Honey Mustard Salmon. A Protein Packed Meal!